Meghan Powers is a doctoral candidate at University of California Santa Cruz, working in the Haddock lab. She is interested in the evolution of bioluminescence. 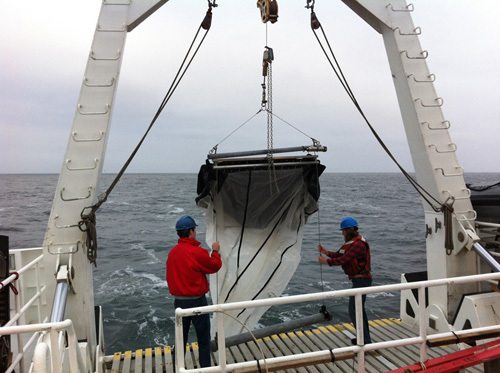 She uses molecular techniques to obtain genetic information from deep-sea zooplankton including cephalopods, chaetognaths, and jellies. She looks for genes that produce the bioluminescent protein. New bioluminescent molecules could be engineered and used to illuminate cells of interest in biomedical research. There are so many luminescent systems and chemistry in the ocean and it is possible that new applications will be useful in biomedical research. Meghan transfers tissue to cryovials for preservation. Right: She uses a microscope to dissect a specimen. One of the groups of animals that Meghan works with are the ctenophores, or comb jellies. Comb jellies are beautiful gelatinous animals that live throughout the ocean. They have ‘combs,’ which are rows of cilia they use to swim. They are the largest animal to use cilia for locomotion. Almost all ctenophores are bioluminescent and generally emit blue to green light. Ctenophores also occupy an interesting place at the base of the animal tree of life. They are important to understanding the early evolution of animals and how complex forms and functions evolved. 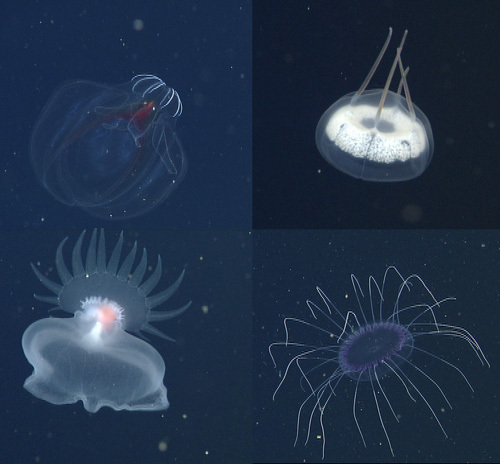 Clockwise from upper left: An amber lobate ctenophore, a vermillion lobate, a deep red cydippid, Bathyctena chuni. Many of the ctenophores have yet to be described by scientists. Meghan hopes to defend her dissertation this fall, so this will probably be her last expedition as a student in the Haddock lab. She has been a pleasure to work with and a great friend to many people at MBARI. We will miss her when she moves on to the next step in her career, but hope she’ll still come on cruises with us in the future! This cruise has been short, but very successful. We had eight dives in six days and today ROV Doc Ricketts had its 500th dive! We were all excited to be a part of this anniversary for the Ricketts and would like to thank the ROV pilots and Western Flyer crew for making this such a great cruise. It’s always fun to go to sea, but with this crew, these pilots, and this science team, we get to learn while laughing a lot, too. When a cruise is coming up, Lynne Christianson, my senior technician, always begs me to bring Susan von Thun along. I always pretend to be wondering whether we have room, but the truth is that she is one of the best people to have aboard the ship. Not only is she helpful in all kinds of lab activities, and does a great job with cruise blogs, but she is actually one of the world’s authorities in taxonomy and natural history of midwater animals. She knows an amazing number of facts (quantity: 999) that nobody else in the world knows (which dragonfish dart away and which stay; what salps have a bluish tint in the video; the depth distribution of undescribed siphonophores; what a Doliolula looks like from 30 meters away). She is a great member of the scientific party and we are grateful that she contributes her knowledge and talents to the success of our expeditions. Clockwise from left: Susan von Thun, Stefan Siebert, Steve Haddock, Casey Dunn, Alex Jaffe, Jamie Baldwin-Fergus, Freya Goetz, Danielle Haddock, Lynne Christianson, Meghan Powers. 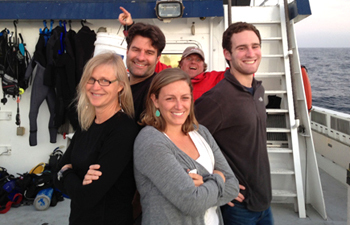 The Haddock lab poses: Lynne, Meghan, Steve, Alex (the photobomber is Randy Prickett).